What a geographically diverse state!!! That's what we found most impressive, I think, throughout the trip. We flew into Boise over what appeared to be barren lands. And that was pretty close to the case in late August. The entire Snake River Plain is sagebrush, grasses and an occasional lava outcropping or actual lava field! 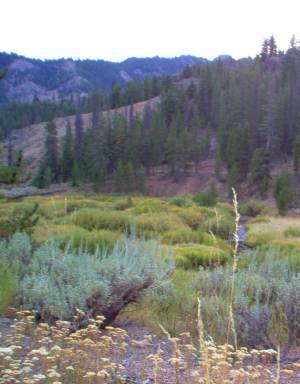 left - Diverse terrain around Anderson Ranch and the western end of the Camas Prairie an hour east of Boise. One afternoon we drove up to the Anderson Ranch area north of Mountain Home (left) and got up into the South Fork of the Boise River drainage. At about 5,000 feet we found a few aspen stands mixed on to the grassy mountain sides. As we drove further up to the small community of Pine, we crossed the South Fork and moved a little higher into the big Ponderosa Pine and spruces. 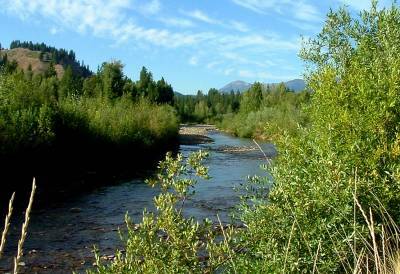 As you can see below, the banks of the South Fork are covered heavily by the button willows, which we found to be the case on all the waters. We didn't fish here as we were saving the license fees for the end of the week when we had every day to fish. But it was worth heading up in there just to see the terrain change from high plains (I kept looking for Clint Eastwood) to high mountains! Actually that first little drive was about five hours total as we were on the western edge of the Mountain Time Zone and it was daylight till after 9 PM with a long lingering twilight still that far north! Eat before you go in there though, you're not going to find a huge selection in Pine. Kind of reminded me of Ole Rawhide's saloon from "A River Runs Through It"
And even up in the mountains there we quickly found out that it was going to be a very warm week. We had one really cool day, but that was mostly because of the wind chill from the 40 MPH winds ripping across the sagebrush plains! Southern Idaho is a hot dry place! 12 inches of rain per year! 95° almost every day that last of August and Labor Day weekend! And that includes the 30° mornings in Sun Valley later in the week, where it still got upwards of 90° by mid-afternoon! 60° sweeps! At 6,000 feet, that's hard on the head! We drove around the Snake River Gorge and had a super nice dinner - truly fresh grilled salmon - and a bit of wine tasting at the Carmela Vinyards looking over the Snake River. That was quite nice! By the weekend we had made it to Ketchum and Sun Valley! 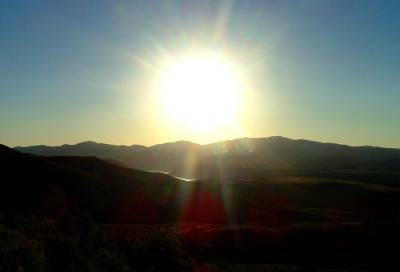 You've got to realize that Sun Valley is more than just the opulent world famous ski resort! 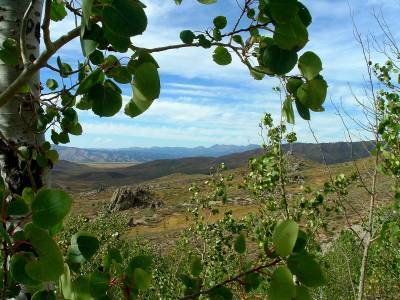 The valley itself runs north into the mountians from the high sagebrush for almost 50 miles to Galena Pass at 8,701'. Over the pass you get into Stanley Basin and the Sawtooths and the Salmon River drainage. 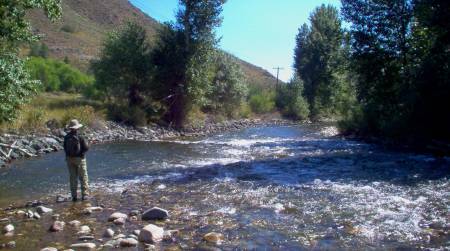 Sun Valley is carved out by the Big Wood River as it runs south from Boulder Mountain! Most of Sun Valley is around 5,500' to 6,000' elevation, but you'd swear it dropped 3,000 feet a mile. The Big Wood is a steep, very fast river with a lot of volume, even right now. Several of the fly shops had said that it was just now getting to nice fishable levels! That's scary! I was a little surprised, after hearing that, that we found any fish in that river! You would have thought they'd all be swept into the Snake River 100 miles downstream! But we did find fish. Nothing extraordinary, but a bunch of nice little wild rainbows. They were really concentrated in the deep pools though. Once you found them, you were really in them! I gave little Warm Springs Creek a shot that evening. It runs around Bald Mountain, home of the famous Sun Valley ski slopes, and into the Big Wood just on the north side of Ketchum. Beautiful little meadow stream that twists and turns through the willows, cottonwoods and sagebrush. 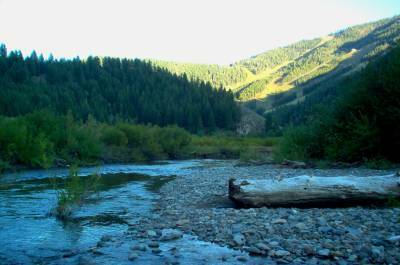 left - Warm Springs Creek at the foot of Bald Mountain, or Baldy. You can see the ski runs in the sun on the north-western face of the mountain in the late afternoon. The town of Ketchum and Sun Valley are on the other side of the mountain which boasts the longest slopes in Idaho, dropping some 3,400' with one run three miles long! The mountain also averages 220 inches of snowfall a year! The stream twists almost back on itself at one point and I took a short-cut through a meadow to get back "upstream" to the car. Mostly I followed a deer trail just wide enough for my feet. I also spooked the deer that was still bedded down in front of me in the tall grass. I was much more concerned with the potential for rattlesnakes in the fallen timber... Another deer crossed the trail up to the car as I worked downstream to where I had gotten in. It's a little odd to have fished downstream about half a mile, take a hike of maybe 100 yards and come out upstream from where you started! Silver Creek - (at right) was an extraordinary place, and lived up to all of its billing! 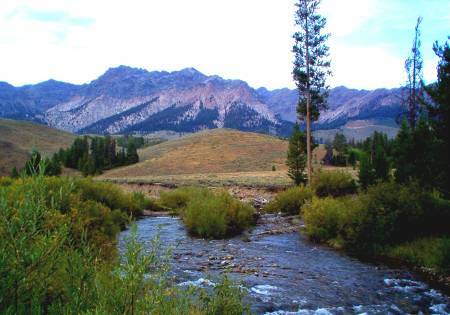 It is outside of the high mountains, back out in the sagebrush plains and irrigated fields south of Sun Valley! But as you can see there are plenty of mountains within easy sight! The stream bed lies at 4,860' - twenty miles to the north is a 7,500 ridge (in the distance) and immediately to the south there is a 6,500' ridge. There are a lot of really nice fish in Silver Creek! Make no mistake. But they are indeed, the toughest fish I've ever seen! If there is not an active hatch on, the big fish just don't feed. It's that simple. Yes, we caught fish. But it was a repeat of the Warms Springs fishing, only this time it was all Browns! 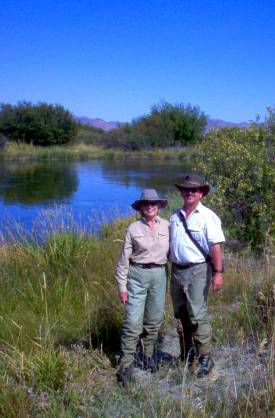 We fished on the Nature Conservancy's Preserve which is an experience in itself. In keeping with Nature Conservancy tradtions and philosophy there isn't anything there. There is a Visitor's Center where you need to check in, but that's about it. The Preserve itself is about 2 1/2 miles long and a mile wide and there are no vehicles on the grounds. You take trails into the Preserve from the perimeter. And the trails are pretty interesting in their own right. Crossing the mouth of a bog known as Sullivan Lake as it trickles through the grasses into the creek you have to walk over narrow wooden bridges and 2 X 12's which is a little spooky. Not so much the narrow boards, but the tall grass around you, which is always swaying in the winds! 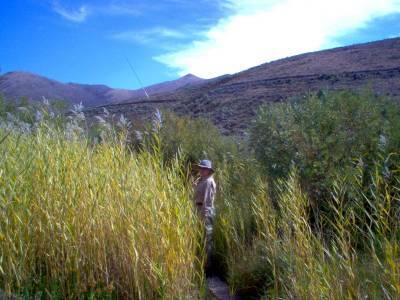 left - Sandy pauses in the tall grass and willows at the downstream end of "Sullivan Lake". The information at the Visitor Center said that there was a moose sighted on the Preserve the week before. You can see how one might be able to get lost in what initially appears to be very open country - but it's not. There's also a large Aspen stand on the Preserve as well. As you walk down the wooden bridge trout dart into the grasses all around you. But it's out in the main stream that you see the big boys. We didn't spot anything huge, but we did see a large number of fish in the 15 to 18 inch class and maybe a couple of 20's. But they wanted nothing to do with anything. Like I said, if there wasn't a hatch on, they weren't interested. I saw just one of the big fish move to eat something. Otherwise they just casually got out of your way. 7X flourocarbon tippets mean nothing to them. One afternoon on that stream just isn't sufficient to get a good feel for what's going on there. I DO recommend getting a guide for this one if you want to get into some of the true trophy fish they have there and don't have a week to get a clue! But if you are ever in that area you do need to experience Silver Creek! It's worth it just for the different fishing if nothing else. Silver Creek appears rather quiet and docile until you step into and realize that there's a heck of a lot of water flowing past you. It's like there are no pockets and backwaters except on the edges of the banks. Otherwise the water flows the same from one bank to the other and despite its flat surroundings Silver Creek really moves. It's formed by maybe hundreds of springs that all get together at this one place. Truly a "spring creek"! 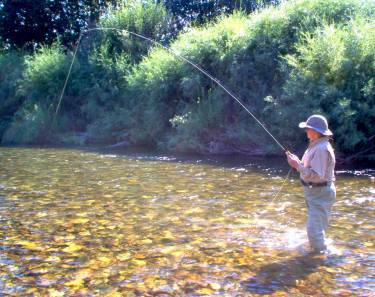 right - Sandy diligently works Silver Creek near Picabo. The 6,500' Picabo Hills are in the background. Great setting to say the least. Apart from the Willows that lined the stream banks and the Aspens and Cottonwoods around the Preserve you can see that the far hills are absolutely treeless! They are covered with rocks, grasses and sagebrush from top to bottom! Just to say we went that way, on Sunday we drove north up Sun Valley, over Galena Pass (just 8,701') and into the Stanley Basin and the headwaters of the Salmon River! That was spectacular drive. Up there the mountain sides transform from grass and sagebrush to all fir, aspen and larch. Just shy of the pass, stopping for a picture, I found out I was apparently extremely allergic to larch! In a matter of seconds my eyes started to itch, swell and water! As soon as I was back into the car with the windows closed I was fine! The only thing different right there was that we were surrounded by larch trees. And that's not the shadow of clouds on the mountian in this shot (below). That's the actual color of the rock faces. Dramatic difference at different elevations up the mountain side! Don't ask me why, I didn't climb up there to find out! But again the valley floor is nice and rolling, almost level. Then you get up to the base of a mountain and it's virtually straight up - 4,000 feet! left - The Big Wood runs past the base of Boulder Mountain. Note the difference in size of the stream compared to the picture above. There's about a six mile distance between the two shots! 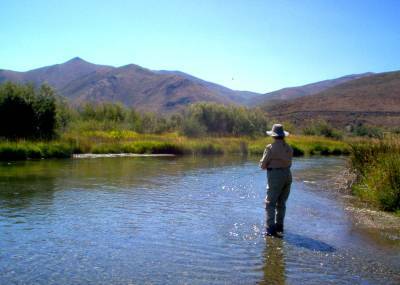 On Labor Day we fished the Big Wood again only this time much further downstream at Hailey. Down there the valley flattens out even more and spreads apart. 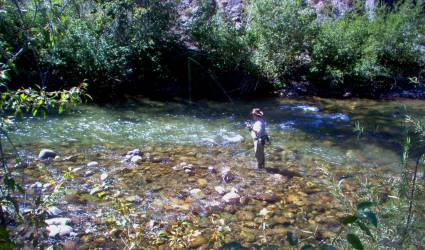 The river is broader and more open and we did some nice fishing down in there for several hours. The afore mentioned Bill Mason had suggested trying some #18 Parachute Adams and Callibaetis. We did - they worked! And those fish didn't seem to mind coming up from two or three feet down in fast water to take that little dry! Again, we didn't catch anything extraordinary, but they were all decent wild fish and put up a heck of a fight in that fast water. Of course if you had survived the flood that they apparently had, you'd be pretty tough too! 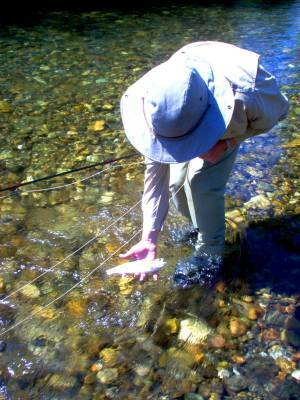 I had to remember a lot of things about how to fish a dry fly in really fast water! Your effective drift was going to be pretty short and quick, that's for sure. The fish could be anywhere out in the gravel shoals. I picked up a lot of fish in riffles that couldn't have been more than 6 or 8 inches deep and running! And it was difficult to spot them too. But those fish would find the least little nook in which to hug the gravel and take anything that drifted past. That's the one nice thing about fast water - the fish are going to eat just about everything that goes by. If it's not food they can always spit it out and go back to what they were doing. Sandy - right - gets in on some action on the Big Wood at Hailey. The fish would hang in the shade up against the banks as well as out in the riffles. Everytime she landed the little Parachute next to the brush the little rainbows would shoot out from the shade to take a shot! Check out the wave wrapped around her leg in that shallow water. It's hoofing it!!! And below with one of the slightly better than average fish. All rainbows in the Big Wood. We were told and research says that there are rainbows, browns and brookies, and even some "Bull Trout" (Dolly Varden) in the drainage, but all we could put our hands on were rainbows. The Redband Rainbow comes from this region and these fish do have more color and a hint of slash under the jaw, not unlike the Eagle Lake strain that we have here. But they are a sleeker leaner fish than the Eagle Lake rainbows. Fun none the less! Did we have fun? Absolutely! Catch a lot of fish? Yes... Big ones? Nope... But that was probably our fault for not having more time on the water. We did do a lot of toodling around just to see the country. Neither of us have ever been in that region! Stay in Ketchum if you want to spend the money. Lodging is pretty high during the peak seasons, and I suppose Labor Day weekend would be considered peak, after all! Unfortunately there is no other place to stay in the area! There are no Comfort Inns or Holiday Inn Express'! I don't think the Sun Valley people believe in them... Actually they're probably not allowed. The food is great and generally pretty reasonable despite the high end world there. The next best bet for accomodations "close" to Silver Creek and Sun Valley is probably going to be Twin Falls 60 miles south! But all the highways are wide open and mostly 65 MPH! It probably really isn't that big of a deal. But when you can see for 60 miles, it sure seems like a long way off!!! I know it's 1,500 miles from here! Back out in the Camas Prairie heading back to Boise on Labor Day. 10,000' Smokey Dome in the distance under one of the few rainclouds that we saw the whole week!